I was not sure what photo I wanted to use for this week's theme "blue" . . . should I go with feeling blue or the color of clothing (being blue) or an item in the photo blue. 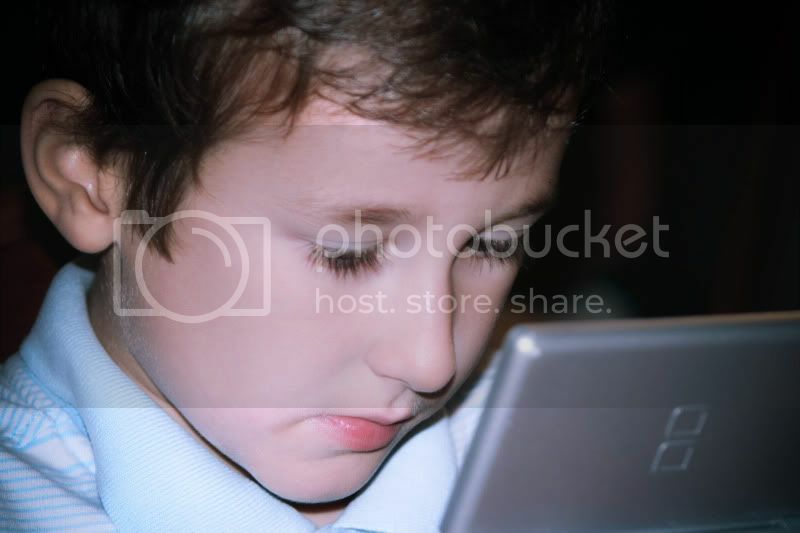 I opted for this photo of my son, intently playing his Nintendo DS and wearing a light "blue" shirt. I love how his concentration can not be wavered even though I took around 15 shots of him, in some of the photos I caught his little tongue out. But this one, I loved that I could see how long his gorgeous eye lashes are! I think I may have to make an investment to grow some of these eyelashes! I love the color of my children's lips. I wish I had pink lips still (mine are white). aww, I guess I am feeling "blue" now over my youth of long lashes and pink lips.